Degrees are from UH Mānoa unless otherwise listed. Conrad Nonaka (’70, ’78) Director, Culinary Institute of the Pacific. Ernest Takafuji (’66) Director, Office of Biodefense Research, National Institute of Allergy and Infectious Diseases (NIAID) (retired). Eric Yeaman (’89) President and Chief Operating Officer, First Hawaiian Bank. Jackie Young (’69) Chief Staff Officer, American Cancer Society Hawai‘i Pacific, Inc. (retired). Larry Price* (’67,’71) On-Air Personality, KSSK Radio. Ren T. Hirose (’85) General Manager, W Scottsdale Hotel. Jillian Inouye (’66, '80, '87) Associate Dean for Research, Schools of Nursing and Allied Health Sciences, University of Nevada, Las Vegas. Tom H. Shigemoto (’71) Vice President of Planning, A&B Properties, Inc.
Stanford B.C. Yuen (’66) Principal, SLC Consulting. Simeon R. Acoba, Jr.* (’66) Retired Associate Justice, Supreme Court of Hawai‘i. J. Kūhiō Asam (’78) Executive Director, King William Charles Lunalilo Trust and Home. Claire L. Asam (’78, ’99) Trustee, Queen Lili‘uokalani Trust and Vice President and Executive Director, SchoolRise, Hawaii Division. Rick Blangiardi (’73) General Manager, Hawaii Now (KGMB & KHNL). Emme Tomimbang (’71, ’73) President, EMME, Inc.
John Waihe‘e, III* (’76) Former Governor, State of Hawai‘i. Edwin Gayagas (’62) Community Service Volunteer and Retired U. S. Army Officer. Alden Henderson (’77, ’82) Epidemiologist, Centers for Disease Control and Prevention. Patrick Sullivan (’81, ’85) Chairman & Founder, Oceanit. Barbara Tanabe (’83) Owner & Managing Partner, Ho‘ākea Communications. David Ezra* (Attended ’67-’68) Senior United States District Judge. Robert Alm (’73) Executive vice president of Hawaiian Electric Company; former EVP of First Hawaiian Bank. Frederick D.S. Choi (’65, ’68) Dean emeritus and Distinguished Service Professor of Business at the New York University Stern School of Business. Patrick H. DeLeon (’73) Retired chief of staff for U.S. Senator Daniel Inouye and Distinguished Professor of Uniformed Health Care Policy and Research at the Uniformed Services University of the Health Sciences. Ted T. Tsukiyama* (Attended ’39-’41, ’46) Attorney, arbitrator, historian and 442nd Regimental Combat Team veteran. Virginia Hinshaw† University of Hawai‘i at Mānoa chancellor, 2007-2012. Ann Dunham Soetoro† (’67, ’83, ’92) Anthropologist who studied the rural poor in Southeast Asia and pioneer in the field of microfinance. Mother of U.S. President Barack Obama and Dr. Maya Soetoro-Ng (’94, ’06). L. Tammy Duckworth (’89) Assistant Secretary for Public and Intergovernmental Affairs at the U.S. Department of Veterans Affairs. Major in the Illinois Army National Guard and Iraq war veteran. Gary Galiher (’71, ’77) Senior partner of Galiher DeRobertis Ono Law Firm in Honolulu. Achieved national renown for his expertise in asbestos litigation. Diane Ono (’73, ’82, ’77) Managing partner of Galiher DeRobertis Ono Law Firm in Honolulu, with expertise in asbestos litigation. Richard Ha (’73) Founder and president of Hamakua Springs Country Farms. John T. Komeiji (’75) Senior vice president of Hawaiian Telcom. Formerly senior partner with the law firm Watanabe, Ing & Komeiji. Hing Leung Sham (’80) Senior vice president of chemical sciences at Elan Biopharaaceuticals. Inventor of two patented HIV protease inhibitor medications. Isabella Aiona Abbott* (’41) Pioneering ethnobotanist, UH emeritus Wilder Professor. Wesley Fong (’65) Attorney and lecturer at the UH Mānoa School of Travel Industry Management, community leader. Ashok Kumar Malhotra (’69) Distinguished Teaching Professor of Philosophy at State University of New York at Oneonta. Virginia Pressler (’75, ’81, ’82) Executive vice president and chief strategic officer, Hawai‘i Pacific Health. Patricia Saiki* (’52) Former congresswoman. Headed U.S. Small Business Administration. Chiyome Fukino (’79) Director of the Hawai‘i State Department of Health. James & Lois Horton (’69) Past visiting professors at UH Mānoa. Dee Jay Mailer (’75, ’85) Kamehameha Schools chief executive officer. Sabrina McKenna (’78, ’82) State of Hawai‘i First Circuit Court judge. Daniel B. T. Lau* (’41) Co-founder of Finance Factors. David McClain† University of Hawai‘i System president, 2004-2009; UH System vice president for academic affairs, 2003-4; UH Mānoa Shidler College of Business dean, 2000-3. First joined UH Mānoa in 1991 as Henry A. Walker Jr. Distinguished Professor of Business Enterprise and professor of financial economics and institutions. Wendie McClain† University of Hawai‘i System community liaison. Walter Kirimitsu (’62) President of St. Louis School, former state judge and UH university general counsel. Jay H. Shidler (’68) Philanthropist, founder of the Shidler Group. Thomas P. Gill* (Attended ’40-’42, ’47) Reform minded attorney, congressman and lieutenant governor. Thomas Kaulukukui, Jr. (’77) Board chair of Queen Lili‘uokalani Trust, former U.S. circuit court judge and Queen’s Health Systems vice president. Samuel Koide (’45) Biomedical researcher and physician, Memorial Sloan-Kettering Cancer Center and Rockefeller University. Patricia Y. Lee (’65, ’79) Attorney with Goodsill Anderson Quinn & Stifel, honorary Honolulu consul to France, former chair of UH Board of Regents. Robert G. F. Lee (’71, ’83) Adjutant general of Hawai‘i State Department of Defense and director of State Civil Defense. Seiji Naya (’58) Chief economist for Asian Development Bank, state economics director, UH emeritus professor. Kent Tsukamoto (’78) Managing partner of accounting firm Accuity. Victor Yano (’74, ’78) Minister of health for Republic of Palau. Founded Belau Medical Clinic. Genoa Keawe* Hawaiian music legend. Charles T. Araki (’57, ’61) Emeritus professor and dean of UH’s College of Education, founding member of UH Letterwinners Club. Elmer Botsai (’00) Emeritus professor and inaugural dean of UH School of Architecture. Frederick Duennebier (’68, ’72) UH geology/geophysics professor specializing in seismic instrumentation for remote areas. Robert P. Hiam (’69) President/CEO of Hawai‘i Medical Service Association. Jong-Wook Lee (’81) Director-general of the World Health Organization and advocate for childhood vaccinations. First Korean to head an international agency. Gary A. Okamoto (’66) Senior vice president/chief medical executive of Rehabilitation Hospital of the Pacific. Carole Kai Onouye (’67) Entertainer, co-founder of Great Aloha Run, executive producer of Hawai‘i Stars Presents. Ronald E. Bright* (’56, ’57, ’73) Retired teacher, founder and musical theater director of Castle Performing Arts Center. Beadie Kanahele Dawson (’81) CEO of Dawson Group, advocate for Native Hawaiians. Attilio Kanei Leonardi (’72, ’94) Retired Honolulu fire chief. Thelma Chock Nip (’50, ’61) Retired educator and school principal. Barry K. Taniguchi (’69) President/CEO of KTA Super Stores. Frank Watase (’50) Head of businesses including Quality! Naturally Foods, Yum Yum Donuts and Sonoma Valley Bagels. Ah Quon McElrath* (’38) Social activist, former UH regent. Helped organize International Longshore and Warehouse Union. Richard Hartman† (’74) Hotelier who's held executive leadership positions with Millennium & Copthorne Hotels, InterContinental Hotels Group and ITT Sheraton. Allan K. Ikawa (’71) Founder/president of Big Island Candies, former chair of UH Board of Regents. Howard Karr (’66) Retired vice chair/CFO of First Hawaiian Bank. Francis S. Oda (’00) Chairman/CEO of Group 70 International architects, senior pastor of New Life Church Honolulu. Puongpun Sananikone (’68) International development economist and business executive, president of PacMar. Patrice Tanaka (’74) Vice chair/chief creative officer of CRT/tanaka public relations and marketing firm. William S. Richardson* (’41) Former chief justice of Hawai‘i Supreme Court and lieutenant governor. Warren Haruki (’77) President/CEO of Grove Farm, former president/CEO of Verizon Hawai‘i. Kevin Hughes (’93) Co-founder of software developer Sprout. Contributed to development of the World Wide Web. Daniel B.T. Lau (’41) Co-founder of Finance Factors. Kurt Osaki (’88) CEO of Osaki Design graphics firm, co-owner of Hukilau restaurants. Donna Tanoue (’76) Vice chair of Bank of Hawai‘i, former chair of Federal Deposit Insurance Corp., past UH regent. Alan Wong (’79) Master of Hawai‘i Regional Cuisine, chef/owner of Alan Wong’s Restaurant. Hiram L. Fong* (’30) First Chinese American to serve in U.S. Senate, co-founder of Finance Factors. Naleen Naupaka Andrade (’76, ’82) Chair of UH Department of Psychiatry. Instrumental in passage of U.S. Native Hawaiian Health Care Act. Jack S. Fritz (’73, ’79) Former speaker of Federated States of Micronesia Congress. Haruyuki Kamemoto (’44, ’47) UH emeritus professor of and researcher in tropical plant and soil science. Robert N. Katayama (’50) President of Kapolei Holding Corp. Served as attorney for the Army and the nation’s largest law firm. Lydia L.W. Tsui (’75) Co-founder/president of Panda Travel. Also involved in real estate development and management. Edwin S.N. Wong (’51) Former chairman and CEO of Waterhouse, founding member of UH football booster club Nā Koa. Kane S. Fernandez† (’58) President and chief executive officer of Fernandez Entertainment. Robin K. Campaniano (’73, ’83) President/CEO of AIG Hawai‘i Insurance Company, former UH regent. Ronald N.S. Ho (’67, ’68) Founder of electrical engineering consulting firm Ronald N. S. Ho and Associates. Daniel K. Inouye (’50) U.S. senator, Congressional Medal of Honor recipient. Francis A. Keala (’53) Former Honolulu chief of police. Initiated local Crime Stoppers and Neighborhood Watch programs. Pamela Samuelson (’71, ’72) University of California, Berkeley professor. Pioneer in digital intellectual property, cyberlaw and information policy. Gladys A. Brandt* (’42) Distinguished kupuna, UH Board of Regents chair. Fred Shiu Leung Chan (’72, ’74) Philanthropist, co-founder of ESS Technology. Doris M. Ching (’63, ’71) Retired UH vice president of student affairs. First woman to serve UH as vice president. Eddie Flores, Jr. (’70) President/CEO of L&L Drive-Inn. Mo-Im Kim (’67) Leader in Korean nursing, first woman to head a Korean government ministry. Michael S. Nakamura (’74) Honolulu Police Department chief. Terry T. Shintani (’79, ’85) UH medical school professor. Created Wai‘anae Diet based on traditional Native Hawaiian practices. Daniel K. Akaka* (’52, ’53, ’66) First U.S. senator of Native Hawaiian ancestry. Dyanne Affonso (’66) Director of clinical pharmacy training program at UH Hilo. David E.K. Cooper (’63) Chairman/president of the Hana Group, retired Army brigadier general. Soon-Kwon Kim (’74) Professor at Kyungpook National University in Korea, Nobel Prize nominee for work on crop diseases and maize hybrids. Beatrice Krauss (’26, ’30) Ethnobotanist, educator author. Ernest K. Nishizaki (’69) Executive vice president of Kyo-ya Co. Developed alumni-student mentor program at UH School of Travel Industry Management. Livingston M.F. Wong (’52) Pioneered transplant surgery in Hawai‘i, founded Organ Donor Center of Hawai‘i, helped develop O‘ahu 911 system. David C. Cole (’76) Chairman/president of Maui Land & Pineapple. Philip Helfrich (’58) Emeritus director, Hawai‘i Institute for Marine Biology. Richard D. Parsons (Attended ’64-’68) Chairman of Time Warner. Barbara Peterson (’78) Former professor of history at UH and California State University, Bernardino. Amefil Agbayani (’66, ’69) UH director of Student Equity, Excellence and Diversity, past chair of Hawai‘i Civil Rights Commission. Chang-Yoon Choi (’70, ’73) Professor at various Korean universities, president of Korea Foundation. Gregory Dever (’78) Director of hospital and clinical services for Republic of Palau, UH professor of pediatrics. Richard H. Kosaki (’49) UH emeritus chancellor. Helped create UH community college system. Abraham Piianaia (’53, ’55) Geographer, historian, educator. Directed first Hawaiian studies program at UH. Rosie Kim Chang (’47, ’77) Retired health administrator. Lobbied for creation of UH School of Nursing. Madeleine J. Goodman (’73) Founding member of UH women’s studies faculty, administrator at UH and Vanderbilt University. David Hyun (’40) Architect. Designed and developed L.A.’s Japanese Village Plaza. Andrew W.S. In (’42) Emeritus dean and professor, UH College of Education. M. Asad Khan (’67) UH emeritus professor of geophysics, former Pakistan senator and minister of petroleum and natural resources. Frederick F.Y. Pang (’58, ’72) Former U.S. assistant secretary of defense for force management. William S. Richardson (’41) Former chief justice of Hawai‘i Supreme Court and lieutenant governor. Yoshiko Sakurai (’69) Writer, former newscaster on Nippon Television Network. Isabella Aiona Abbott (’41) Pioneering ethnobotanist, UH emeritus Wilder Professor. Michael J. Chun (’68) President and headmaster of Kamehameha Schools. Dewey H. Kim (’50) Retired chancellor for UH community colleges. Helen R. Nagtalon-Miller (’51, ’67) UH instructor of education and French. Francis Y. Sogi (’49) Retired partner of Kelley Drye & Warren law firm. Ben Taguchi (’54) Engineer, retired president of M&E Pacific. Jeanette C. Takamura (’69, ’72) Dean of Columbia University School of Social Work, former U.S. assistant secretary for aging. Walter A. Dods, Jr. (’67) Chairman of First Hawaiian Bank and Hawaiian Telcom. Robert M. Fujimoto (’51) Retired chairman of Hawai‘i Planing Mill, former UH regent. Edward Hirata (’56) Former Honolulu director of transportation and vice president of Hawaiian Electric Co.
Satoru Izutsu (’50) Senior associate dean at the UH medical school, emeritus professor of psychiatry and public health. Lawrence M. Johnson (’63) Investor, retired chairman/CEO of Bank of Hawai‘i. Kent M. Keith (’77) Former president, Chaminade University. Wrote best-selling book Anyway: The Paradoxical Commandments. William Hiraoka* (’39) Former president, National Mortgage and Finance Co., and Island Insurance Cos.
S. Haunani Apoliona (’67, ’73) Advocate for Native Hawaiian rights, chair of Office of Hawaiian Affairs. Patricia Lanoie Blanchette (’72, ’74) Chair of UH Department of Geriatric Medicine. Vernon Char (’56) Partner in law firm Char Sakamoto Ishii Lum & Ching, first president of UH Alumni Association. Kan Jung Luke (’36) Real estate entrepreneur, educator, co-founder of Hawai‘i National Bank. Ralph M. Miwa (’48, ’50) UH administrator. 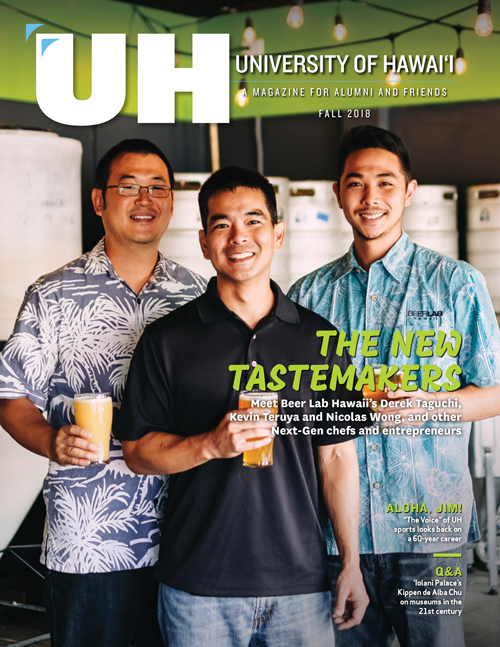 Instrumental in founding UH West O‘ahu. Margaret Oda (’47, ’77) Former district superintendent of education. Patsy Saiki (’54, ’59) Educator, author, state Department of Education administrator. James Walker (’59, ’62) Coordinator of international agriculture for U.S. Department of Agriculture. Michael B. White (’72) General manager of Kā‘anapali Beach Hotel on Maui. Walter Wong (’67) Former director of environmental health for Monterey County Health Department. Marion Diamond (’35) Educator, musician, entertainer. Hiram L. Fong (’30) First Chinese American to serve in U.S. Senate, co-founder of Finance Factors. Fujio Matsuda (’43) UH emeritus president, former state director of transportation. Sharon Narimatsu (’67, ’75) Retired UH administrator, former president of Honolulu Japanese Chamber of Commerce. Harriet Natsuyama (’59, ’60) Mathematician, physicist and systems engineer. Former professor, California State University, Fullerton. Momi W. Cazimero (’55) Owner of Graphic House design firm, former UH regent. Stanton Ho (’75) Executive chef of Chocolates a la Carte in California, former executive pastry chef of Hilton Las Vegas. Thomas K. Kaulukukui, Sr. (’38, ’39, ’41) First UH football player to earn All-American honors, Office of Hawaiian Affairs trustee. Donald C.W. Kim (’58) Chairman/CEO of Amkor A&E, former chairman/CEO of R. M. Towill Corp, past UH regent. Dorothy I. Matsuo (’50) UH emeritus director in student affairs. James M. Morita (’36) Attorney, co-founder of City Bank. Andre S. Tatibouet (’64) Owner of Aqua Waikīkī Wave Hotel, founder of Aston Hotels & Resorts. Joyce S. Tsunoda (’60, ’65) Emeritus chancellor for UH Community Colleges. Joshua C. Agsalud (’55, ’61) Retired teacher, former state official. Robert H. Hughes (’38) Retired sugar industry executive, president of Hawai‘i Sugar Planters Association, former UH regent. E. Alison Kay (’57) Noted researcher and UH emeritus professor of zoology. Ah Quon McElrath (’38) Social activist, former UH regent. Helped organize International Longshore and Warehouse Union. Wayne Carr Metcalf, III (’75) Per diem judge, former state legislator and state insurance commissioner. Marie Nakanishi Milks (’66) Retired circuit court judge. First Asian American woman appointed to state judiciary. Richard Penhallow (’26) Parker Ranch manager, UH regent. Helped establish Hawai‘i Preparatory Academy and Parker School. Larry D. Price (’65) Co-host of Perry & Price Show on KSSK Radio, former UH head football coach. Tina M. Shelton (’80) Director of public relations for UH medical school, former television news anchor.